He claims it is an old war wound, but we think he just cut himself shaving. Acidmaw kills him after his battlecry. Won a game because of this. This should really be easier to remove with less self-damage and less health. It makes for absurd priest openers where one must have hard removal on turn three or lose. He is useless for all classes except for priest. turn 3 drop (enemy forced to deal with it) turn 4 double resuREKT! More like it's used in 2 percent of existing decks and 90 percent of it belongs to priest. I'm honestly shaking my head at bpcookson and FootLoosePie here. You guys don't understand; this doesn't need any interactions to be good. It's already solid and on curve. Priest can simply sink any leftover mana they have into it in order to make it even better — and trust me, that class has many turns where they'll do pretty much nothing. This isn't a 7 mana 4/7; it's a 3 mana 4/3 that becomes even better if you're playing a Priest. Side note: Light of the Naaru seems to have been made for this guy. Love rolling this card in my priest deck, but I agree. It is too much dependency on cards/spells to fully activate him. 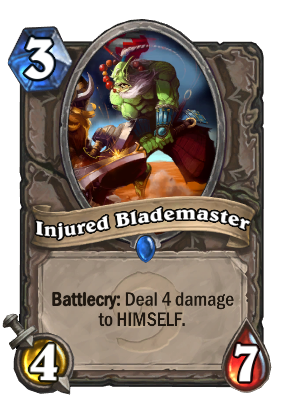 The '3' cost ends up being more just to get him back to full health. Even if you get a card draw, not sure if the synergy is dependable long term. Such a great Priest minion! Has potential with a Lightwell and some Northshire Cleric action... but that feels like a lot of dependency.